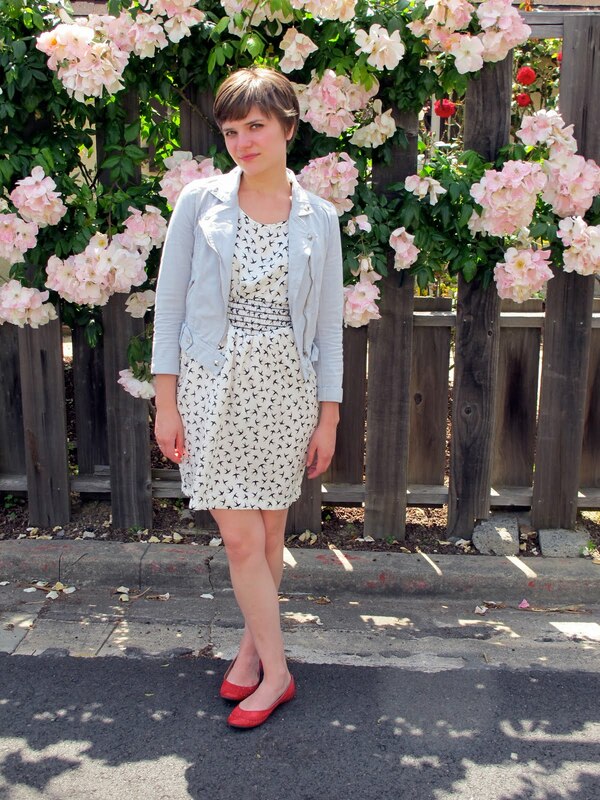 At last, here is my final San Francisco outfit photo, featuring my favorite find: this Miu Miu-esque flock frock! I always fall for anything with birds, and the versatility of the black and white palette made it all the more appealing. This dress is awesome! I'm on a hunt for (affordable) avian prints, and this is perfection. You know what I love besides your outfit? The fact that you're wearing red ballet flats and the floral background... brilliant! I am loving the flock frock! I love the dress, I love the name too. i really like the sweet bird print on this dress. pairs well with those cute red flats. I just bought similar shoes in that shade of color and i'm LOVING it. I'm a total sucker for birds too. Those flowers behind you are beautiful. Wow that dress is amazing!!! such a perfect summer dress. want! That dress is amazing. Love it with the flats. I adore this dress. Great print and it looks very nice on you! It's a wonderful picture and a very pretty dress. I like the combination with the jacket and the flat shoes. Love the print of your dress so much! So cute! cute dress! i love the red flats, too..
that dress is so Miu Miu I LOVE IT!! lekisskiss.blogspot.com <--Texas gal bloggin fashion from NYC! And i love it paired with the red flats. Ahhh I'm in love with this dress! It is very Miu Miu-esque haha. Very cool jacket as well. This entire outfit is just lovely. I adore the dress, and I just love how fabulous it looks paired with those red flats and the jacket! Truly great. This is by far my fave of your San Fran outfits! Love the dress + red flats combo. that dress is so pretty! i adore the print! have you seen it online anywhere? CUTE! Everyone is really diggin' Miu Miu this Spring, hey? I mean, me too, me too! Love the cat print. If I were rich I would so get something, maybe the cat print flats. I digress. ;-) Love it with the jacket too. Love this print so much. Birds! I love the dress, and it really does look like the miu miu print. Very cute look!